With the release of the Ivy Bridge CPU came new chipsets, specifically Z77. 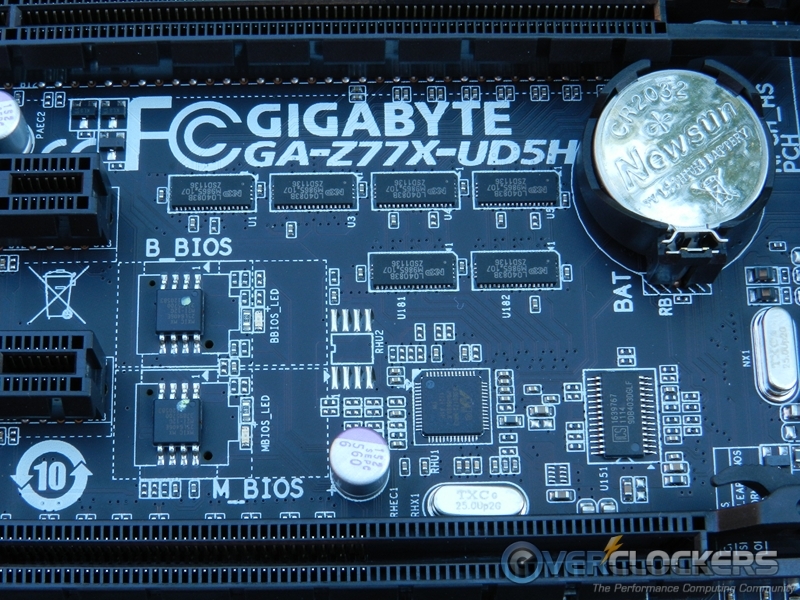 No board manufacturer, including Gigabyte would miss that boat, and of course came out with their own Z77 based motherboards. 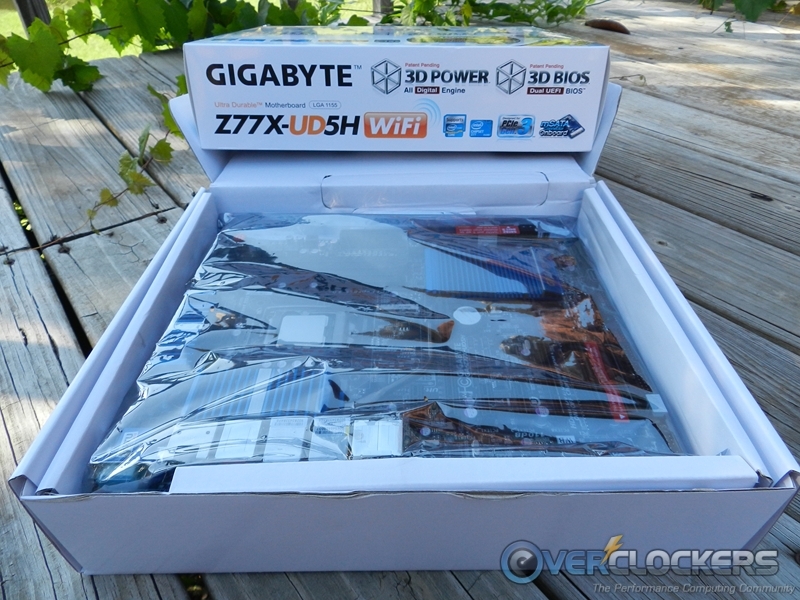 Today we have a chance to review their current top of the line (that isn’t a ‘gaming’ motherboard), the Gigabyte Z77X-UD5H-WB (WiFi). 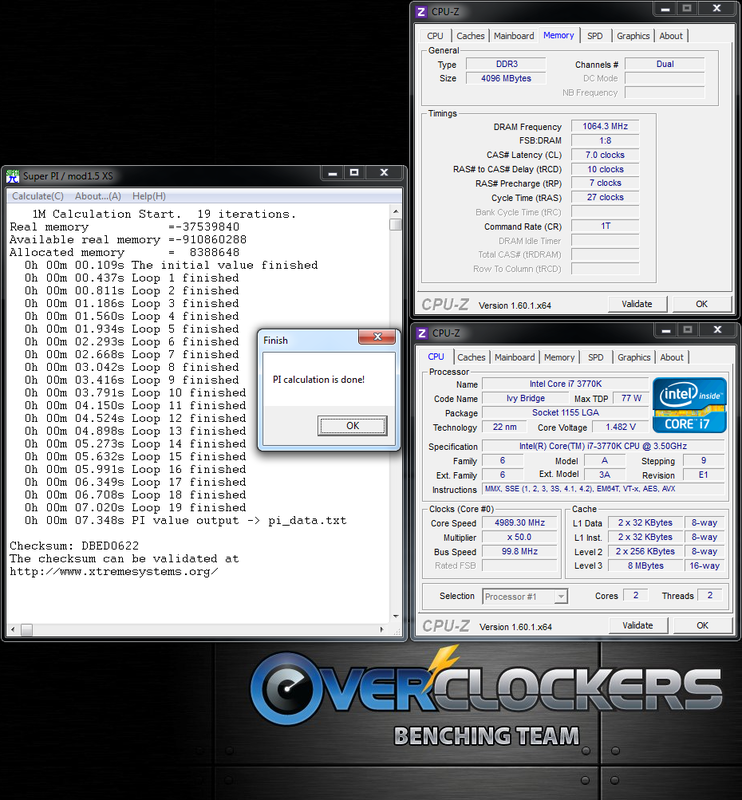 Let’s take a look at whats under the hood and how far she wants to push our Ivy Bridge CPU. 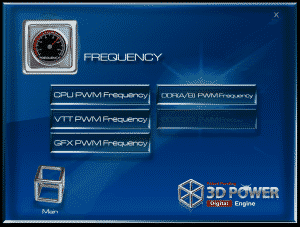 You can see from the list below some older features like the 3D Power and 3D BIOS, as well as their “333” onboard acceleration. This board brought with it Bluetooth capabilities, 300Mbps dual band WiFi, Ultra Durable 4, onboard mSATA connectivity, as well as Lucid Virtu MVP. That’s just the tip of the iceberg. 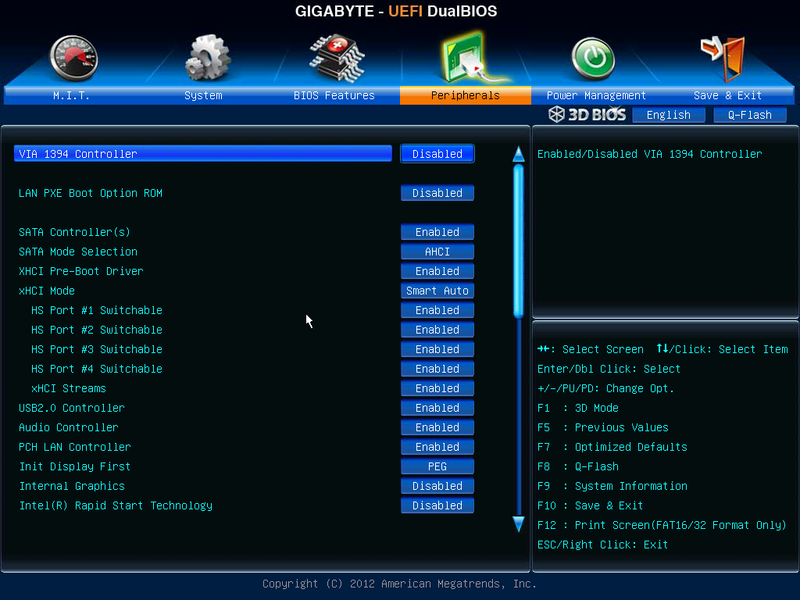 The huge list of detailed specifications can be found on Gigabyte’s website, here. 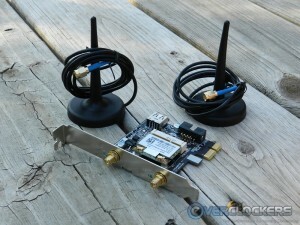 The motherboard also includes an exclusive PCIe expansion card that offers support for the latest Bluetooth 4.0 and IEEE 802.11 a/b/g/n Wi-Fi connectivity. The Bluetooth 4.0 standard includes Smart Ready technology that is debuting on mobile device. This means that transferring important content from your smart phone or tablet is easier and faster than ever. GIGABYTE Z77 series motherboards take advantage of an exclusive All Digital PWM controller array, to deliver power to the board’s 3rd generation Intel Core processor. 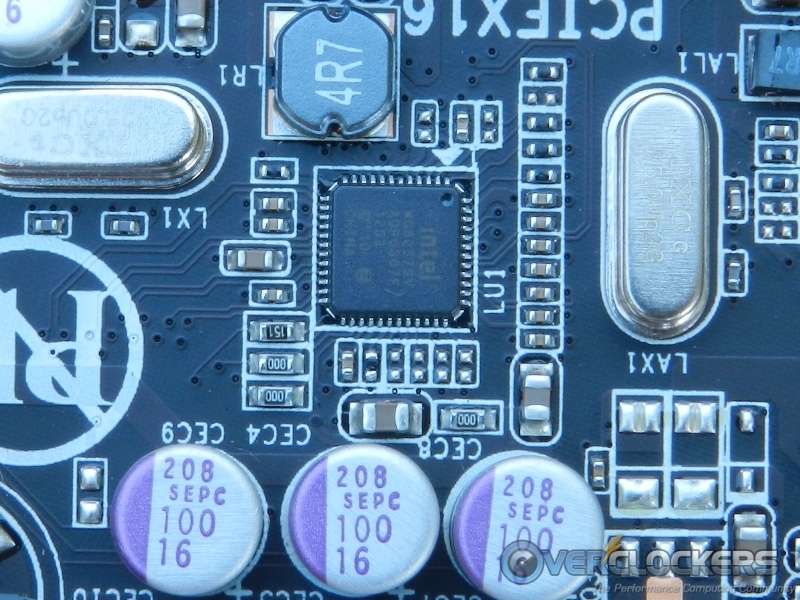 Using entirely digital controllers means that more precise power delivery to the motherboard’s most power hungry and energy sensitive components is possible. 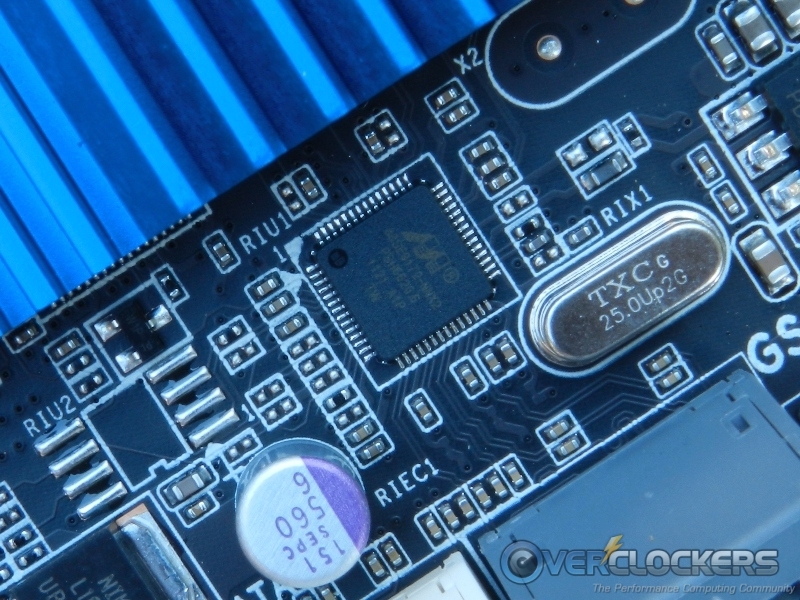 These components include the CPU, VTT, processor graphics and memory, without doubt the most important components on your motherboard. 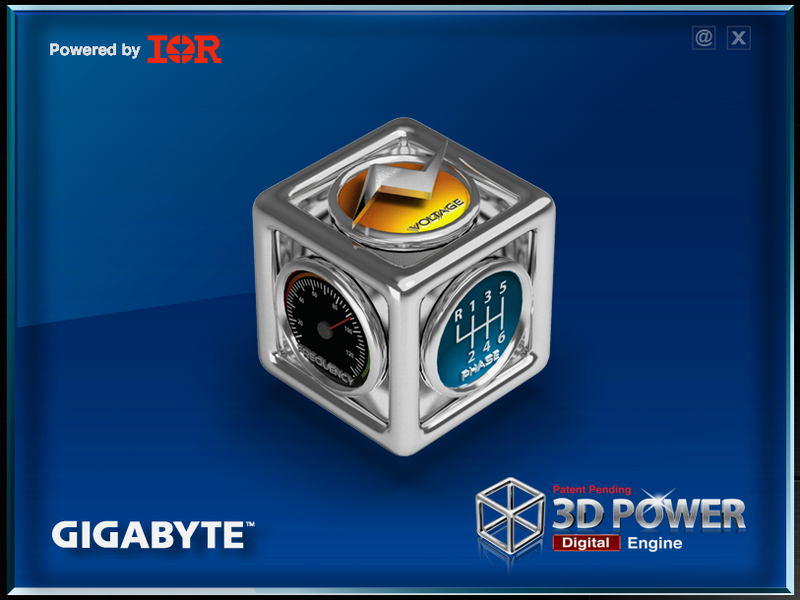 This All Digital Power system, with Precise Auto Voltage Compensation, provides you with exceptional control over the component power delivery on your GIGABYTE 7 series motherboard. GIGABYTE 7 series motherboards take advantage of the latest connectivity and expansion bus technologies available on the Intel platform. The 3rd generation Intel Core processor platform debuts the new PCI Express gen. 3.0 expansion bus, allowing users to take advantage of the next generation, high-bandwidth discrete graphics card solutions. 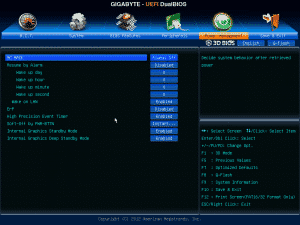 GIGABYTE Ultra Durable™ 4 motherboards embrace a range of exclusive technologies that guarantee DIY PC builders the absolute best protection for their PC, with built-in features that prevent common malfunction threats. 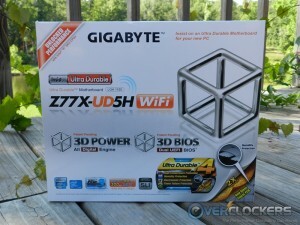 GIGABYTE 7 series motherboards support Lucid Virtu GPU virtualization technologies – optimized virtualization software that improves your PC’s visuals, with faster response times, improved video processing and smoother media playback, all within a low power environment.Lucid Universal MVP also features Hyperformance, which eliminates redundant rendering tasks and predicts potential synchronization issues in the graphics delivery pipeline, producing faster frame rates, sharper visuals and reduced tearing. 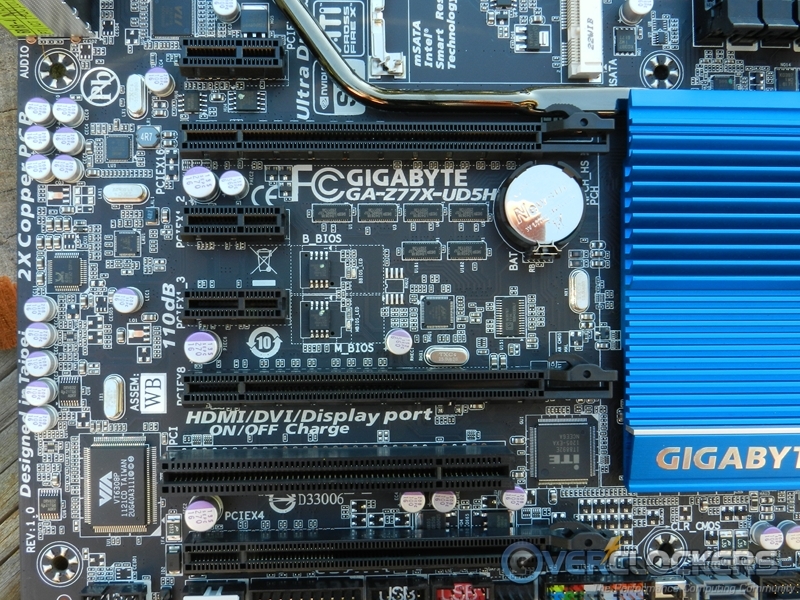 GIGABYTE 7 series motherboards feature an onboard mSATA slot allowing users to easily take advantage of advanced SSD-based technologies like Intel Smart Response and Intel Rapid Start. 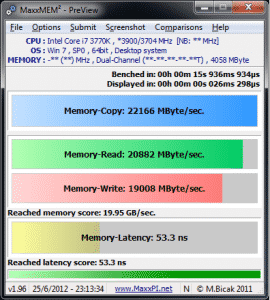 Mounting an affordable, low capacity mSATA SSD directly onto your motherboard can enhance your PC’s performance with better overall desktop responsiveness, faster boot times and faster system resume from ‘Suspend to Disk’ and ‘Standby’ modes. GIGABYTE 7 series motherboards feature ON/OFF Charge, a unique GIGAYTE technology which allows you not only to charge your iPhone, iPad or iPod Touch, but also allows you to Quick Charge it. As an added bonus, it can even be charged when your PC is turned off, so even if you forget to plug it into your charger after you’ve synced up your music, it will be fully charged when you need it. GIGABYTE’s cutting edge 12 phase power VRM design utilizes the highest caliber components to provide unadulterated, smooth power to the CPU. 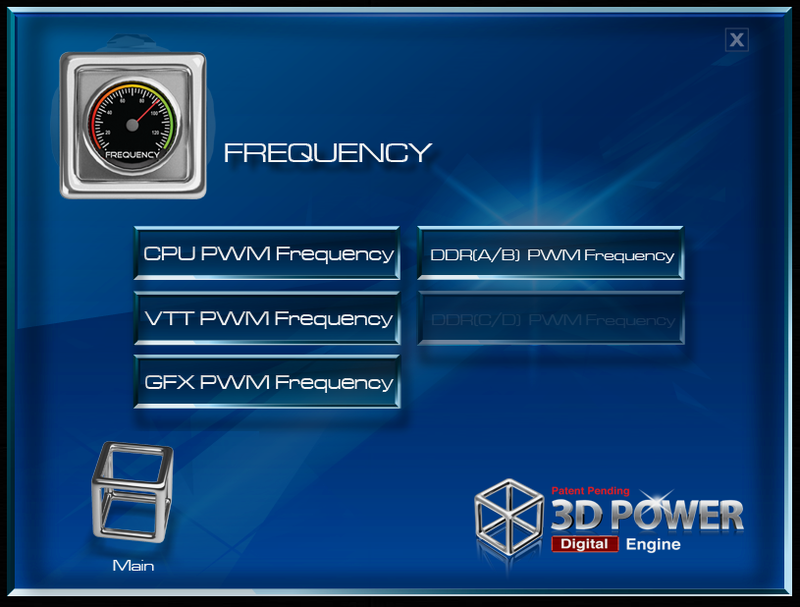 The innovative 12 phase power VRM has been designed and engineered to deliver fast transient response times through quick and seamless power delivery during extensive CPU loading variations. In addition, heat from the VRM is effectively reduced by spreading the load between the 12 power phases, resulting in a cooler, more stable platform. Taking a look at the retail packaging, you will see your typical marketing/feature sets listed on both sides. 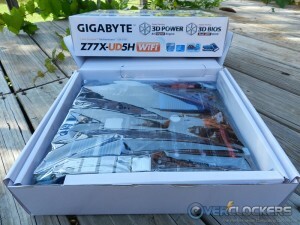 The rear of the packaging goes in to much more detail while the front attempts to stay high level, and talks about 3D Power and 3D BIOS, as well as the Ultra Durable 4 features among other items. 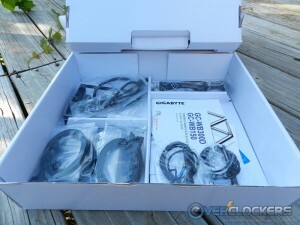 When you open the box up, you are greeted with the motherboard sitting on top in its protective anti-static bag, and all of the many accessories in their own compartment below the board. 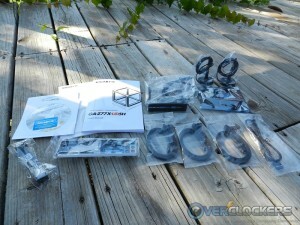 Below you will see the included accessories in more detail. 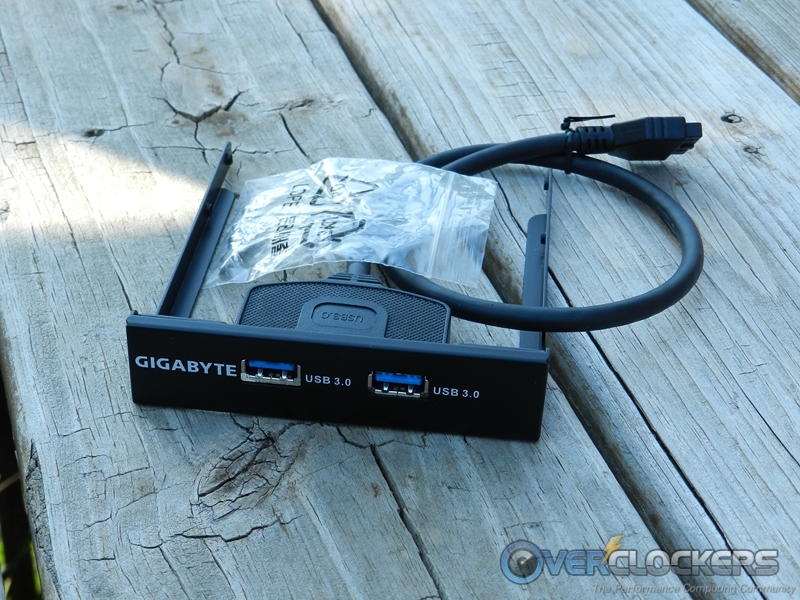 For example, included is a 3.5″ front panel with dual USB 3.0 ports, along with the WiFi/Bluetooth adapter and antenna. Additionally, you have the rear I/O plate, several SATA cables, and the instruction manual. 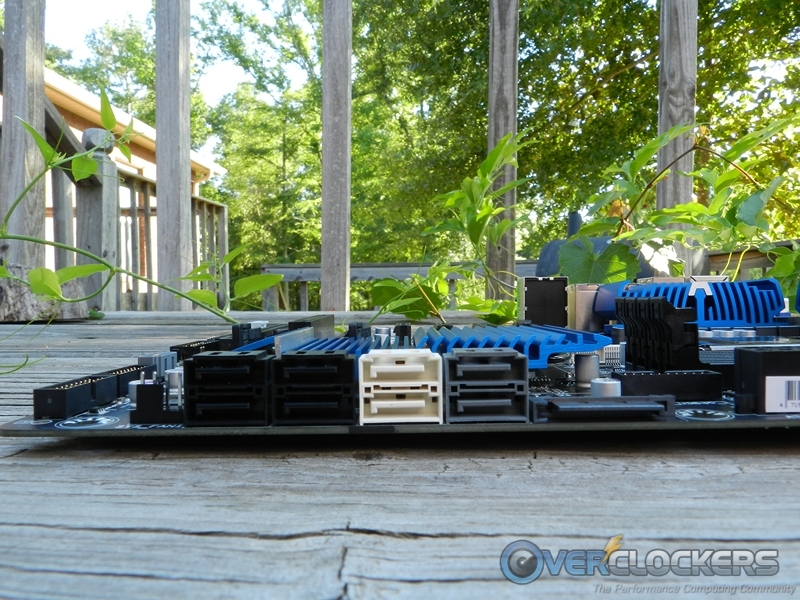 Moving on to the board, you can see a black PCB and DIMM slots along with blue coolers for the PCH, and VRM areas. All PCIe slots are black, and the SATA ports are designated by color for each controller (white port is the Intel for you SSD owners). 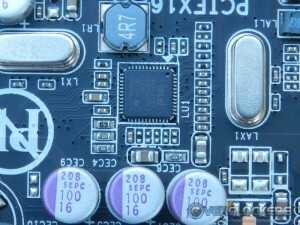 In the upper right hand corner are the power, reset, and clear CMOS buttons, along with the voltage read points. All in all a nice looking board, though I have to admit I was a bigger fan of the black and orange combination of the previous generation UD7. 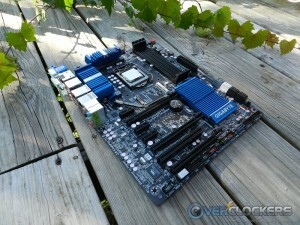 Here are a few more shots of the motherboard. I’m thinking it looks pretty good from any angle, you? Taking a closer look at the board, first it comes with a few warnings. 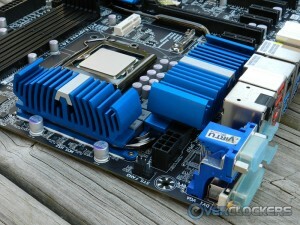 The first one pictured is in the PCIe slot area which states in order to use that slot you must have an Ivy Bridge CPU. 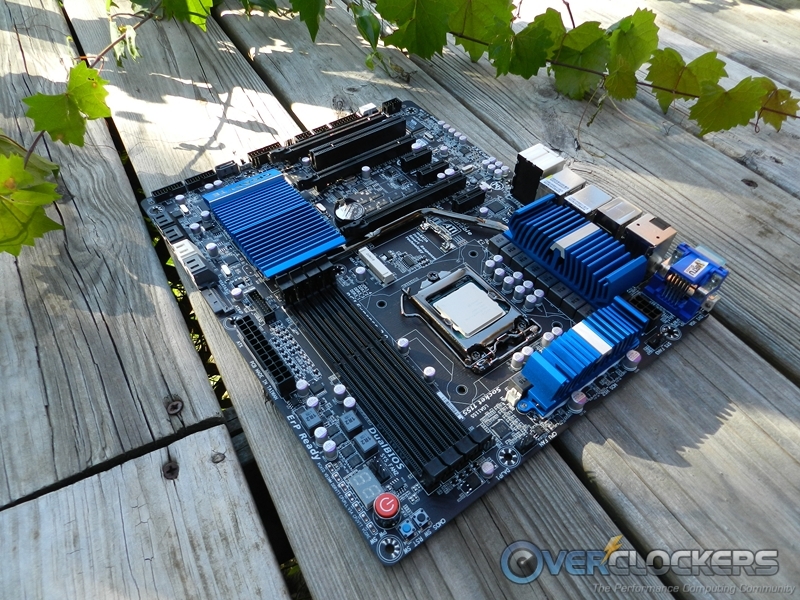 This is because it offers more integrated PCIe lanes than Sandy Bridge. 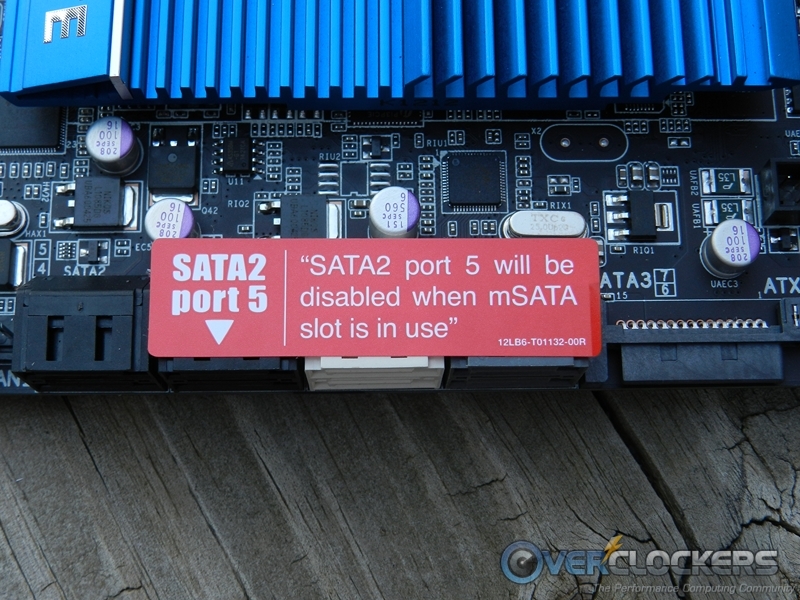 Another item to take note of is that SATA port 5 will be disabled when an mSATA device is inserted in its slot. 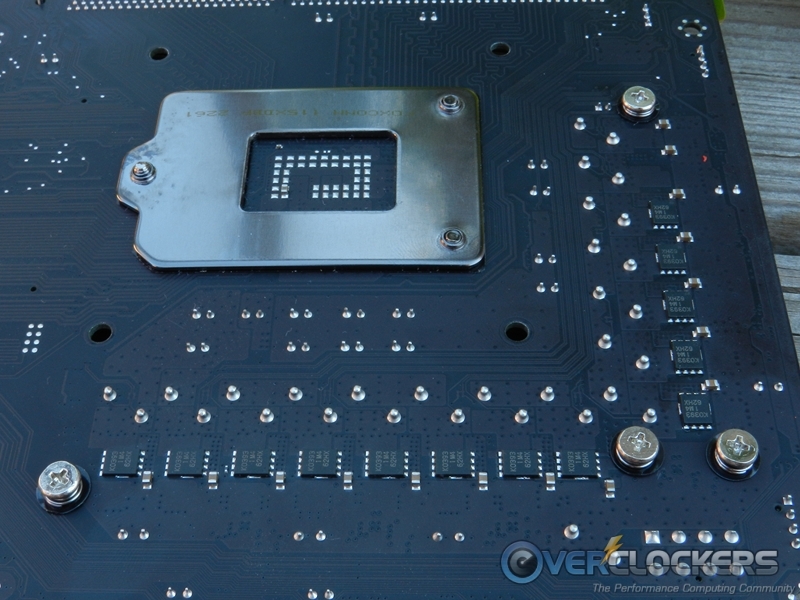 This is an alternate angle shot of the socket area showing off the blue VRM heatsinks hiding the ample 15 power phases (6×2 + 2 + 1) for the CPU, iGPU, IMC, the mSATA port, and some of the DIMM slots. 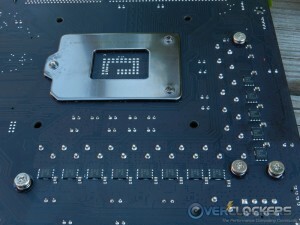 Also pictured is the portion of the I/O area where you would use the onboard graphics of an Ivy Bridge or Sandy Bridge CPU. As mentioned previously, the upper right area has the onboard power, reset, debug LED, and clear CMOS buttons. 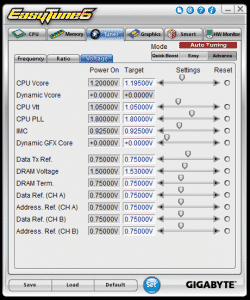 The voltage measure points located here ares a necessity for the extreme Overclockers if they do not use a case, and require more accurate voltage readings than software can provide. 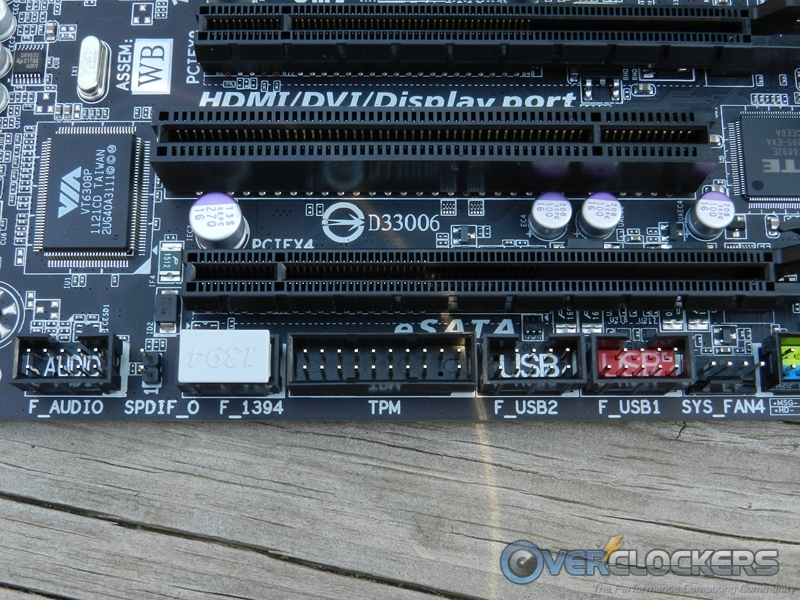 The built in mSATA port resides below the CPU and above the first PCIe 16x slot. You can find mSATA drives on newegg.com starting at $59.99 to throw your OS on, which will improve boot times and system response through Intel’s Smart Response Technology. 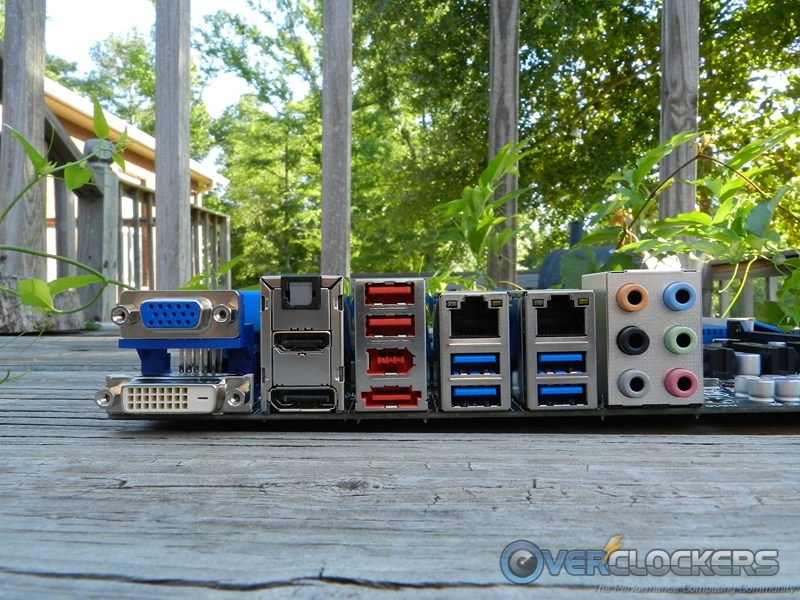 The right side has a 24-pin ATX power connection, four DIMM slots, 19-pin USB3.0 connector, and a SATA power port for additional power required by multiple GPU configurations (supplements the power for the PCIe slots). This is not used when running single or dual card configurations. 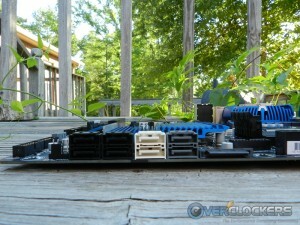 Pictured here is the expansion slot area showing three PCIe 1x (physical) slots, three PCIe 16x slots (physical, 16x, 8x, 4x electrical), as well as one legacy PCI slot. 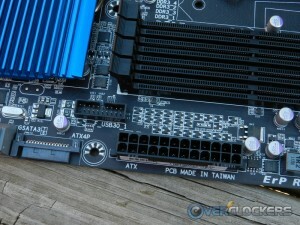 In the second picture, you can see six PCIe 3.0 switches and the two BIOS chips. Across the bottom you have your typical connectivity ranging from front audio, Firewire 1394 port, USB2 connections, front panel connections, BIOS switch, and two 20 pin USB 3.0 ports; your typical offerings. 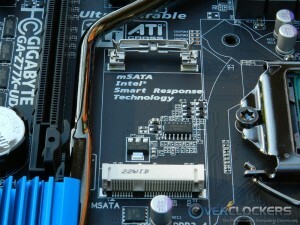 Here you can see the SATA port configuration with the grey and white being SATA3 (the white are Intel, the grey Marvell), and black being SATA2. 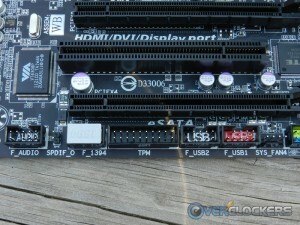 There are plenty of ports for all your SATA based devices. Taking a look at the I/O area, you can see VGA, DVI-D, HDMI, and Display Port connectivity for the video side of the house. I can’t imagine a remotely modern monitor not having one of those! 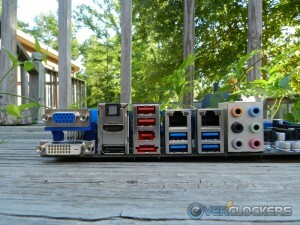 Next, four USB 3.0 ports, dual Gigabit LAN. Optical out and analog inputs/outputs round out this area. Also pictured is the onboard Realtek ALC898 chip, and the Intel NIC chip. 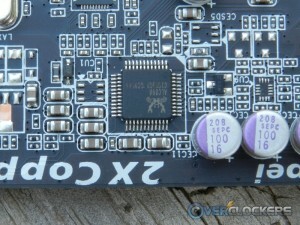 Backside MOSFETs don’t have heatsink screws on top of them like the X79-UD3. Outside of that, there is not much to see on the backside of the board. 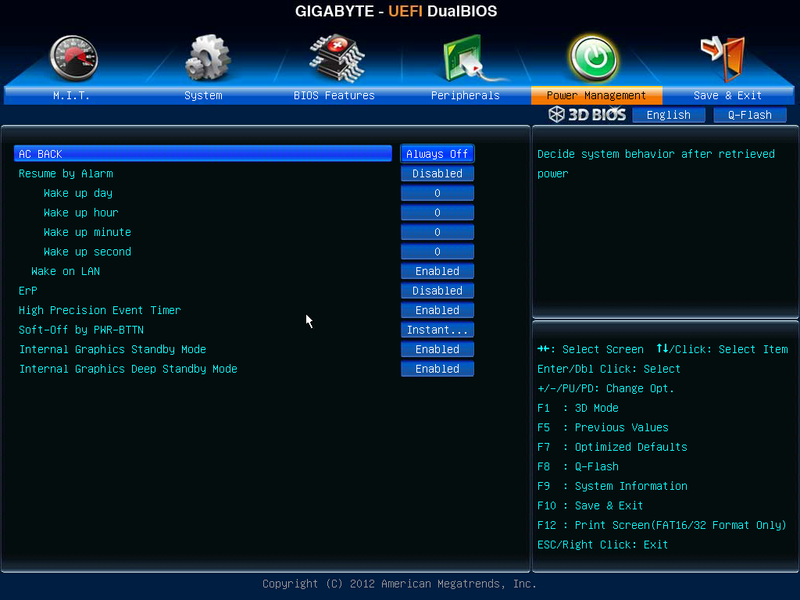 Here you will see the main sections in Gigabyte’s UEFI BIOS. 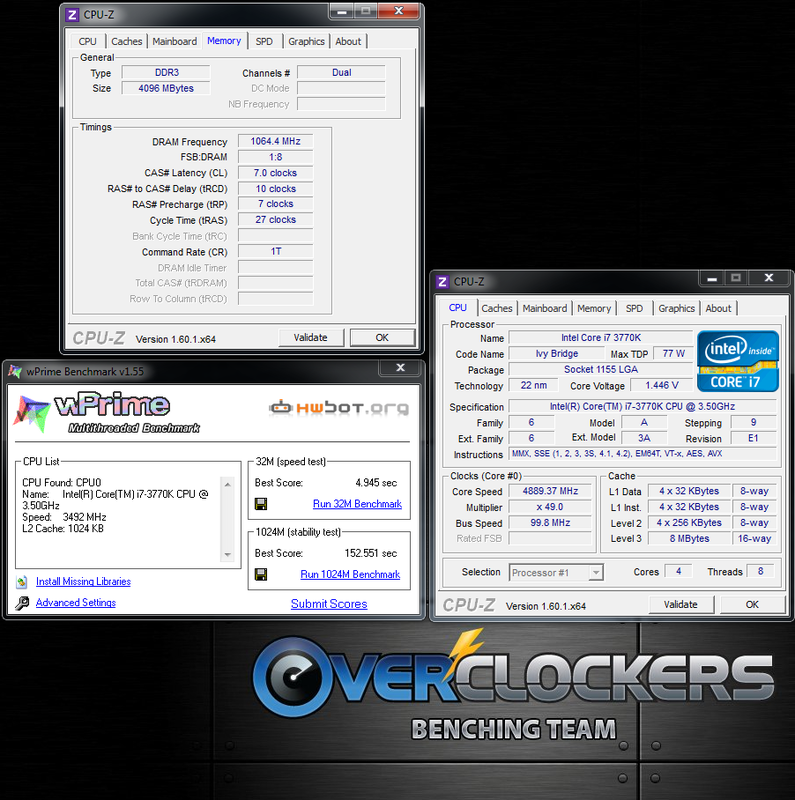 The M.I.T area has all of the overclocking and tweaking options, as well as a current status of clock speeds, temperatures, voltage of the CPU. 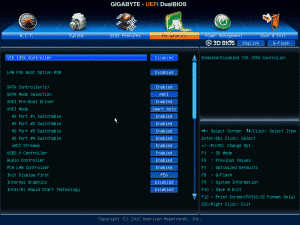 The System and Features sections show your boot options and priorities among other things. 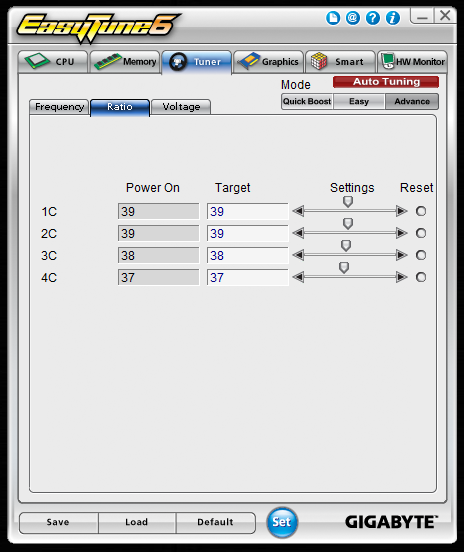 The Peripherals screen is where you can change your SATA port mode, and enable/disable your audio, USB, and NIC, and the iGPU. Below are some screenshots of the options that Overclockers would like. I could drone on all day about each screen outside of these but mostly the options are the same, so I will not get in to that. 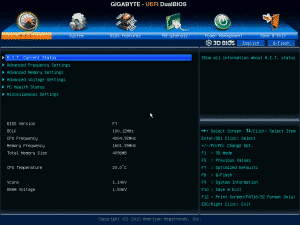 In this BIOS you have everything you need to overclock regardless if you are on air, water, or any extreme cooling method. 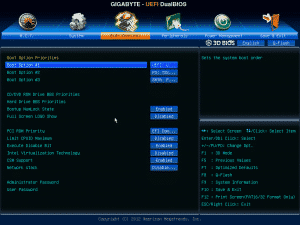 Gigabyte owners for the past couple of years will not need to be introduced to their in house monitoring/overclocking utility, Easytune6. 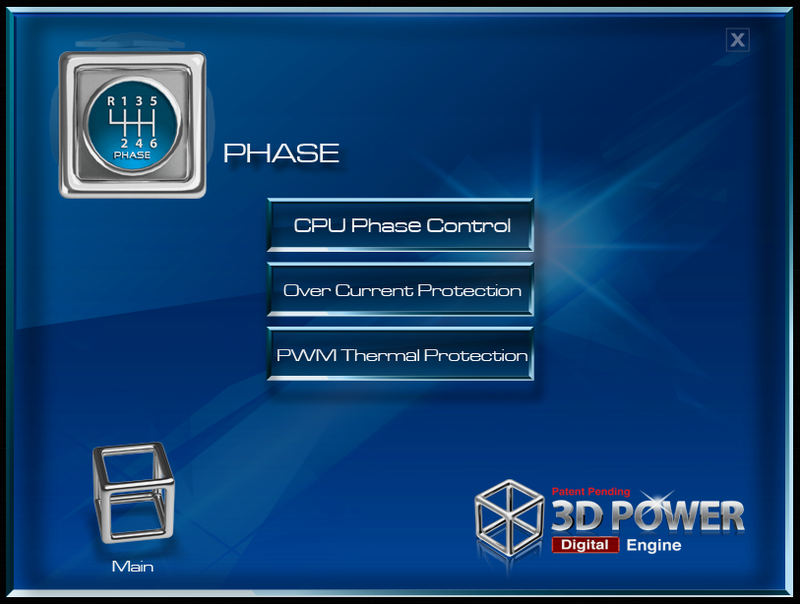 Not much has changed with this software through several versions, outside of the necessary updates for different CPU/Chipset architectures. 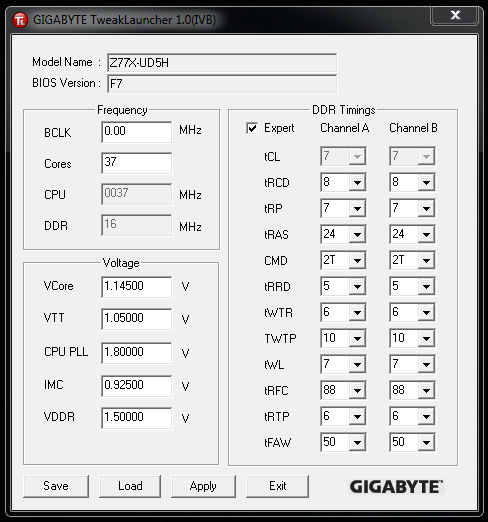 Outside of a couple issues with X79 based overclocking (that may be fixed by this point), ET6 is a great tool to get the last few MHz out of your extreme overclock, and can help tweak many settings in Windows. Speaking of many settings, pictured below is the voltage adjustment page. There are more than enough options here to get the most out of your hardware. 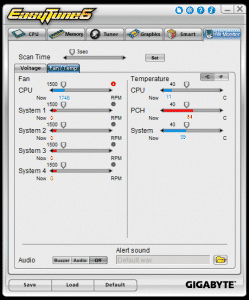 ET6 also has graphing capabilities to monitor voltages and set temperature thresholds and fan speeds, for fans plugged into the motherboard. Next we see a new addition to the windows based overclocking from Gigabyte, called TweakLauncher. 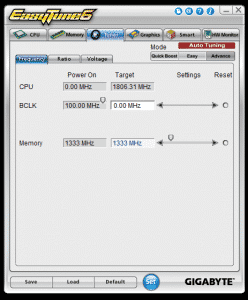 You can see below there are options to change your primary, and several secondary ram timings. The 3DPower options you see below, are really another way to handle your power functions. This software gives you Windows-based control over items like CPU, VTT, IMC, DDR PWM frequencies, voltage response, over-voltage protection, load line calibration, and phase control. 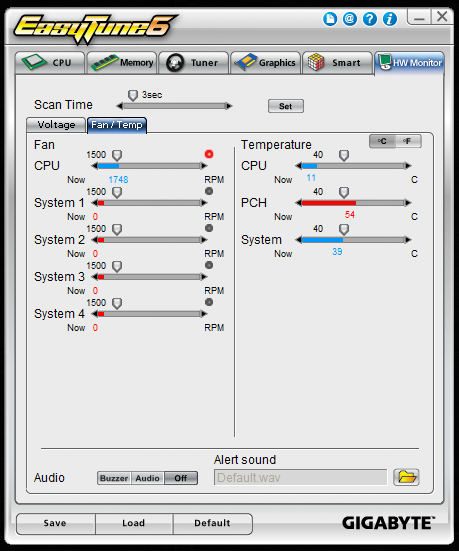 Those are tools that are usually reserved for the BIOS, but its nice to see this functionality available from within Windows, beyond what your typical overclocking software provides. 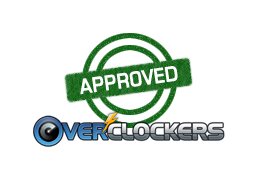 Now we come to my favorite part of the review, the overclocking. 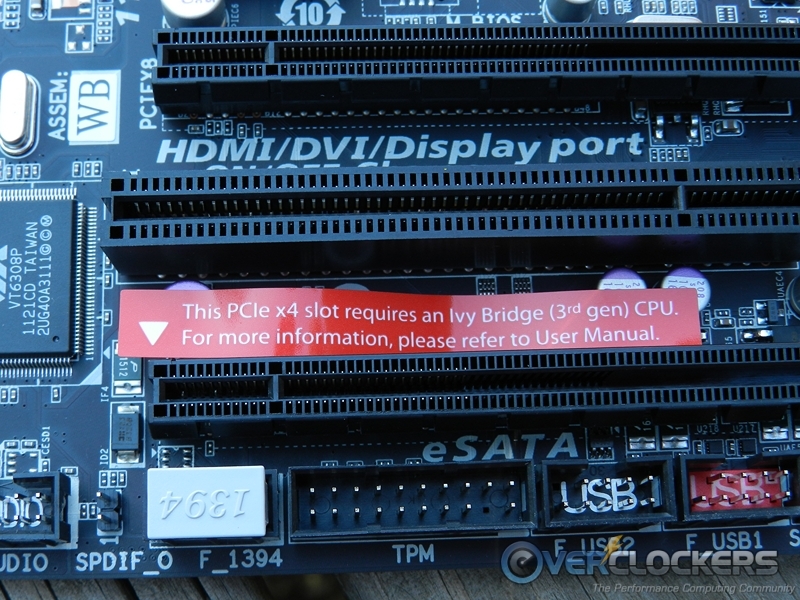 As I’m sure everyone knows, Ivy Bridge runs hot, especially when you are comparing it to Sandy Bridge. Our very own I.M.O.G broke the news on why this is happening. For those that don’t recall, or don’t want to use the link, it is mostly due to Intel switching to a thermal paste instead of the flux-less solder used in the past. Tests have shown removing that thermal paste, and going bare die or replacing the thermal paste and IHS, the temperatures drop a few degrees. 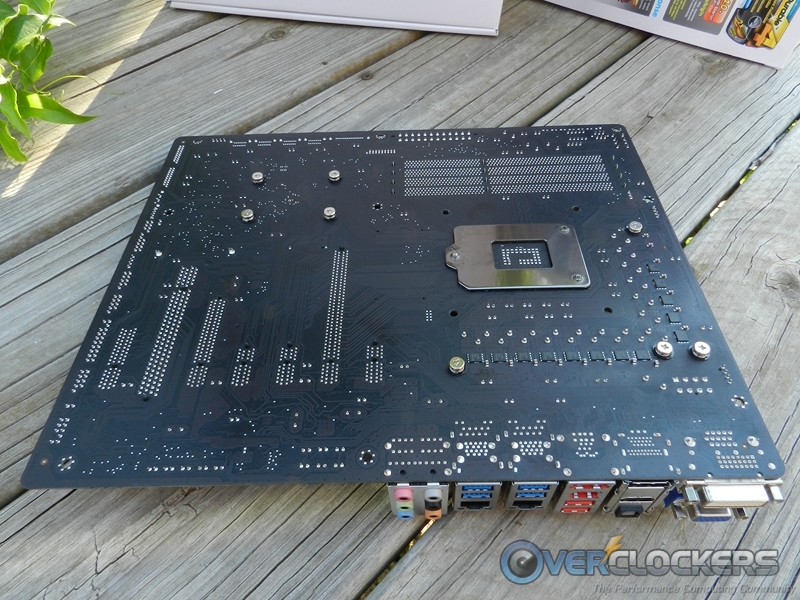 Of course this isn’t the whole story, the transistor density is greater, and the area of the cores to dissipate the heat is smaller, partially due to the larger iGPU Ivy Bridge has to offer. So let’s get on with it. 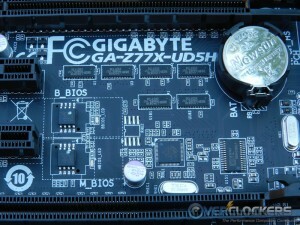 The board shipped with BIOS F7, and currently F8 is the latest release from the Gigabyte website. 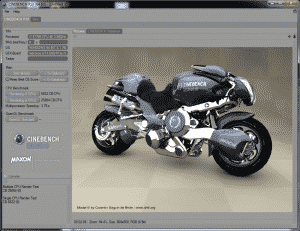 I am using a beta release, F8c for this testing. 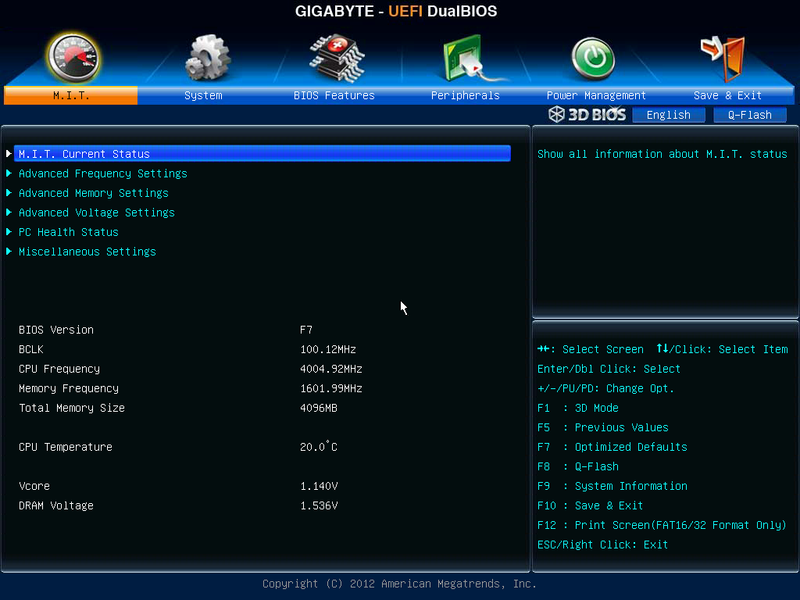 This BIOS seems pretty stable for the most part. The only issue I am currently having with this board is with the memory (and the problem exists on the F8 release BIOS as well) and its a good one. With the sticks listed above, I am unable to do anything outside of auto settings. Even when I attempt to set the speed and timings manually, I get caught in a boot loop. 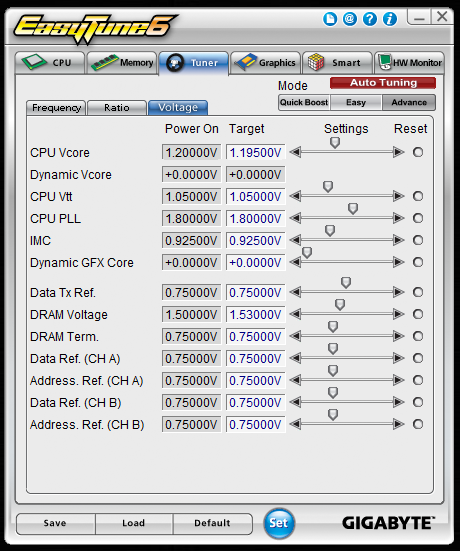 I tried another set of sticks (Visiontek 1600Mhz) and they can set manually which leads me to believe this is likely a compatibility issue with the set I am using. I have to imagine another BIOS will resolve this issue…whenever they release one (last BIOS on their website was 5/13/12). 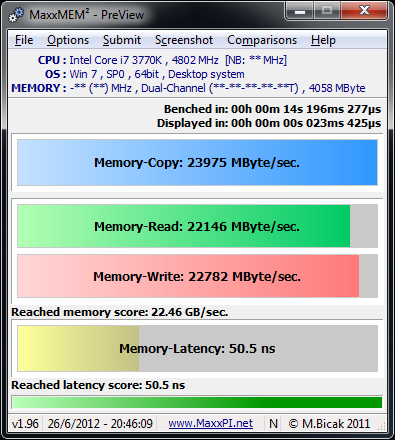 With that out of the way, I was able to reach a benchable clock speed of 5Ghz with this board in SuperPi 1M. As you will notice from the screenshots, I dropped down to two cores and two threads just to give me some headroom on temperatures. 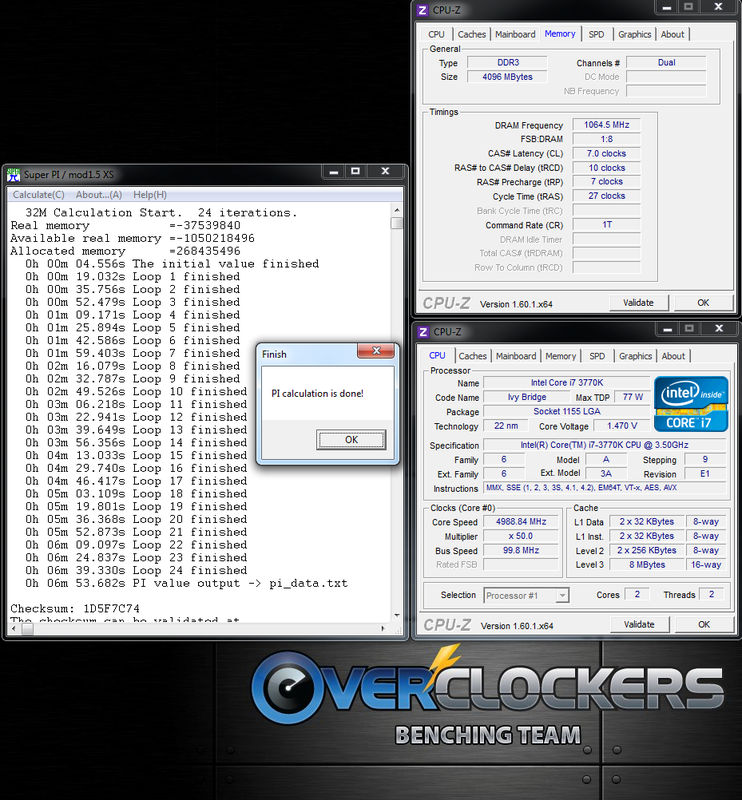 The 3770k I have requires a lot of volts at 5 GHz (1.47v actual under load) so temperatures, even with two cores, managed to hit 75 °C (23 °C ambient),. There probably is a bit of headroom left in the tank though. Jumping in to Wprime, which as most know use all cores, temperatures became an issue and there was some throttling at 5Ghz. 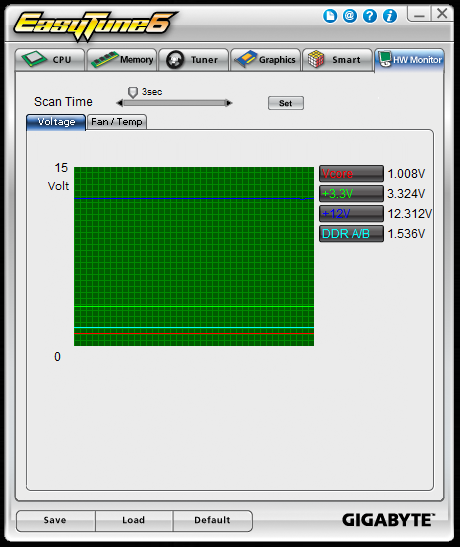 I was able to lower the multiplier to 49x and the voltage to 1.42 load and got through those tests. Below are the results. Not pictured is some BCLK testing. 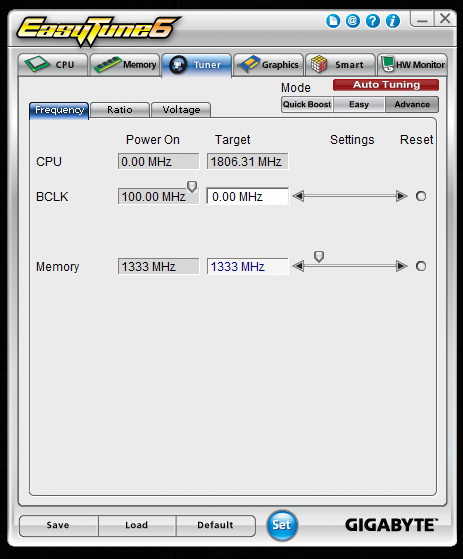 I was able to run this board up to 106 MHz which doesn’t seem too bad for water cooling. Anything over that, even .1 of a MHz caused the board not to boot. I would imagine getting her a bit colder and things could change on that front. 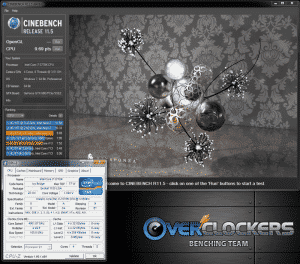 Last we have some synthetic benchmark runs in Cinebench (R10 and 11.5), MaxMEMM, and AIDA64 memory benchmarks at both stock speeds (with Turbo) and at 4.8Ghz. 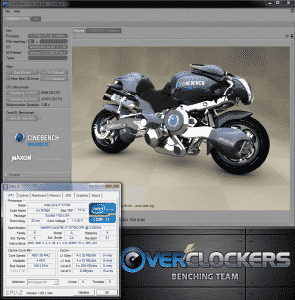 With overclocking the processor you can see significant gains in the CPU tests in both single and multi-threaded tests (Cinebench), and even some improvements in the memory testing, both bandwidth and latency just from the CPU speed increase. 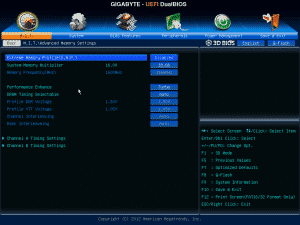 Gigabyte has brought a few new features to their Z77 lineup, and the UD5H, including their Ultra Durable 4 technology, Lucid Virtu Universal MVP, and having a mSATA port on this board. 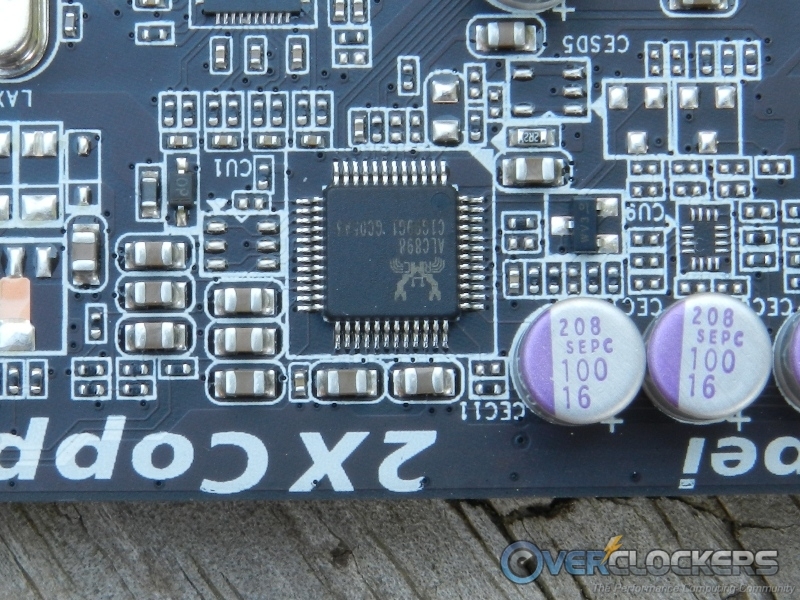 They have moved away from the black on black the previous X79-UD3 board had, and added a bit of blue into the existing Z77 lineup. 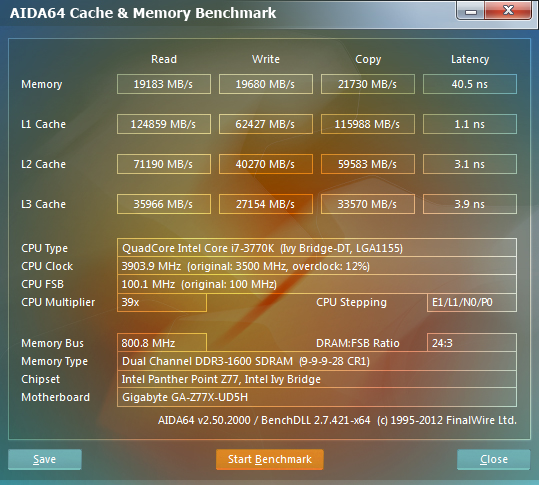 Performance on this UD5H, which is currently the highest end motherboard available in the Gigabyte lineup, was as expected. I was able to reach the heat limits of the chip well before the board stepped in (if it ever would). Under water, I was able to achieve a BCLK of 106 MHz which isn’t too bad. As far as memory goes, leaving the settings on auto worked fine, however attempting to push past that point via multiplier or manually setting the timings/voltage just didn’t want to happen, and caused a boot loop. On another platform (P67/Z68), I know these sticks are good to well over 2200 MHz, so I’m afraid its the board with a memory incompatibility. My suggestion is to stick to the QVL list for now to achieve the highest memory clocks. 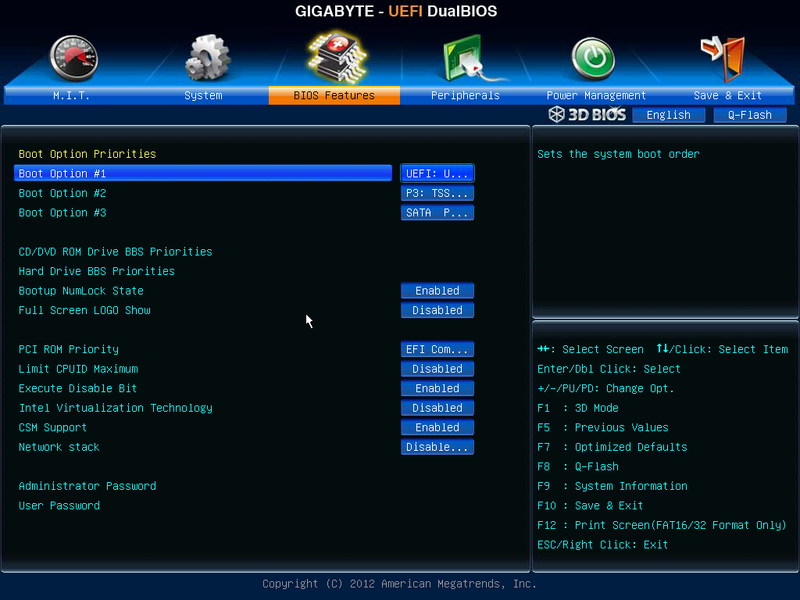 Along those lines, I have been waiting for a BIOS update either beta or from the Gigabyte website and none have come across for this board. 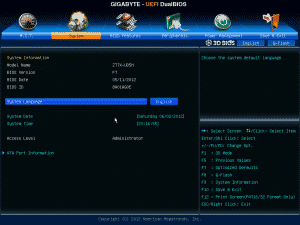 The last version on the Gigabyte website is dated 5/13. 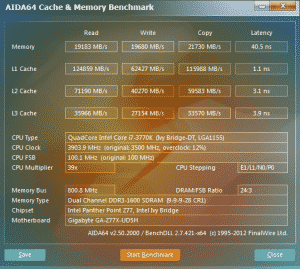 Hopefully another is released soon and that adds more memory compatibility. Overall Gigabyte has a solid board here, loaded with features for all kinds of users. The included WiFi/Bluetooth negates the need for purchasing such products, and any user would find this a good ‘value added’ feature. The ever so picky enthusiast is taken care of with a more than adequate power section, voltage read points, and power/reset/clear CMOS buttons right on the board along with a debug LED, making troubleshooting and extreme benchmarking easier. 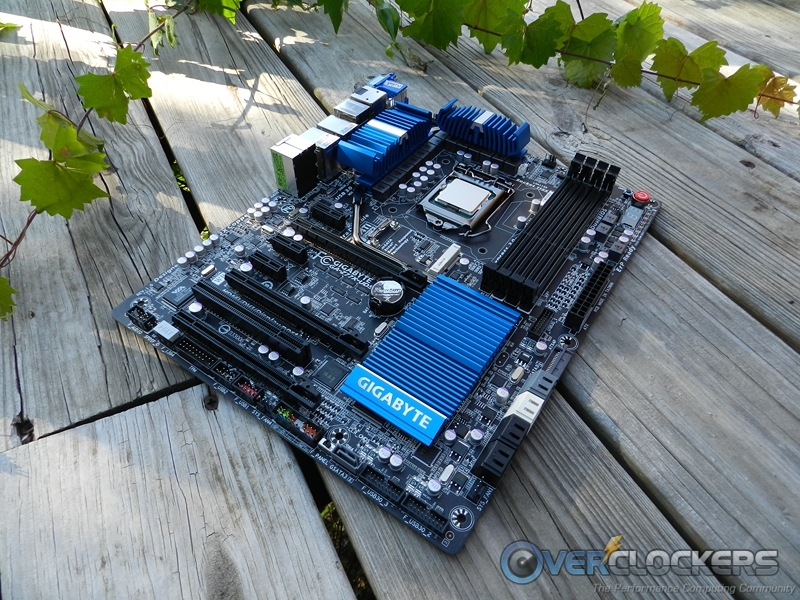 Currently you can find the Gigabyte Z77x UD5H-WB for $209.99 at newegg.com putting its pricing just about in the middle of the other Z77 boards. 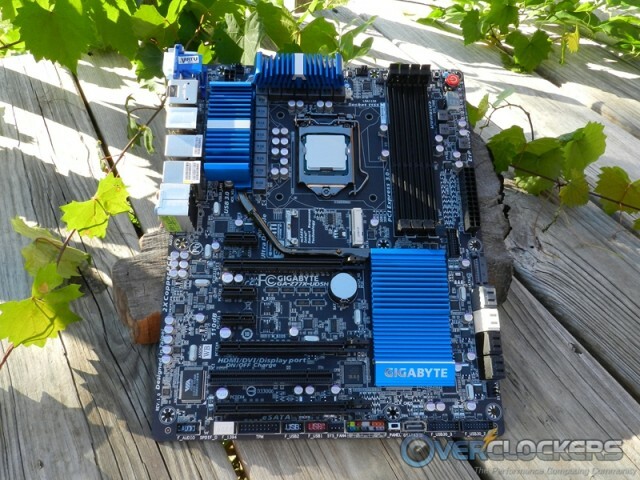 The only concern I have for this board is memory compatibility and more frequent BIOS updates to help resolve those issues but that certainly shouldn’t be a make or break point for purchasing this board, especially if you stick to the QVL list as all other functions I tested worked fine. 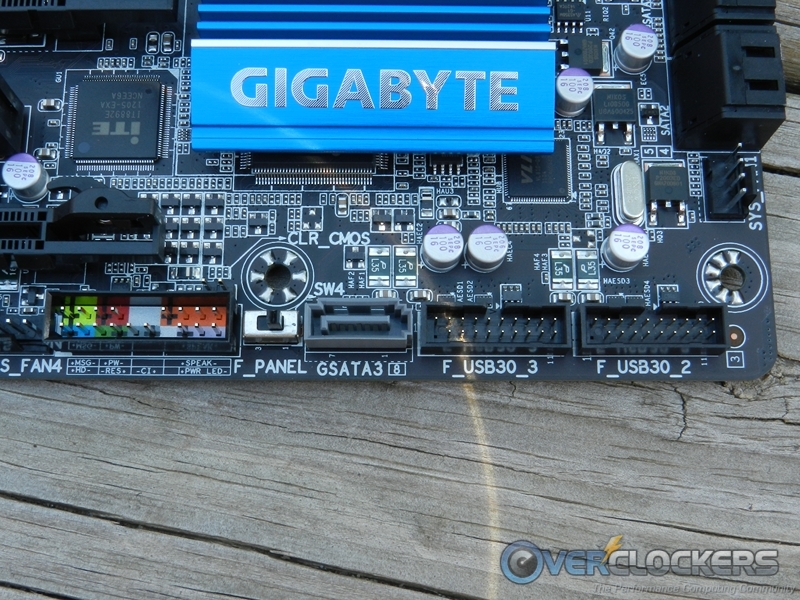 For all the features you have with the Z77X UD5H-WB along with the price point, Gigabyte has put out a board worthy of the most discriminating of users. Thanks for the review. 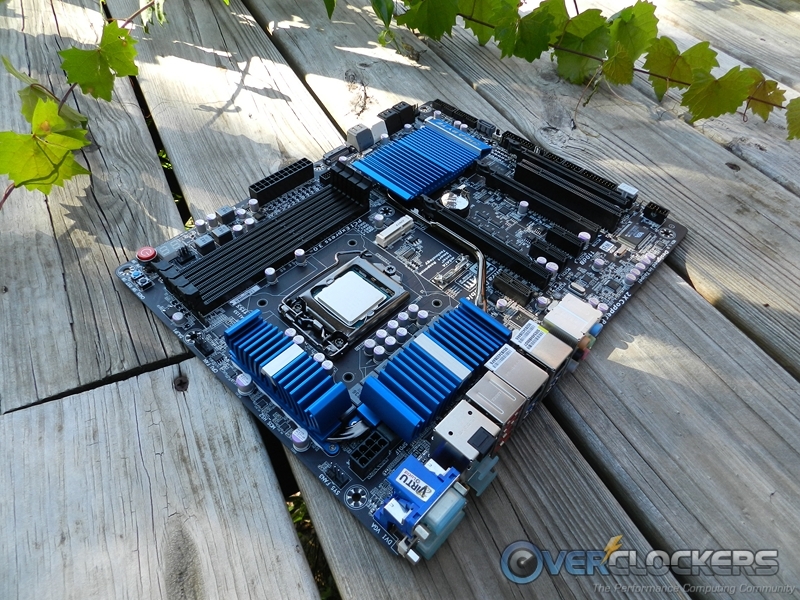 This Motherboard has certainly caught my eye. Good color combination, price isn't bad, and has the wifi card. Good review. 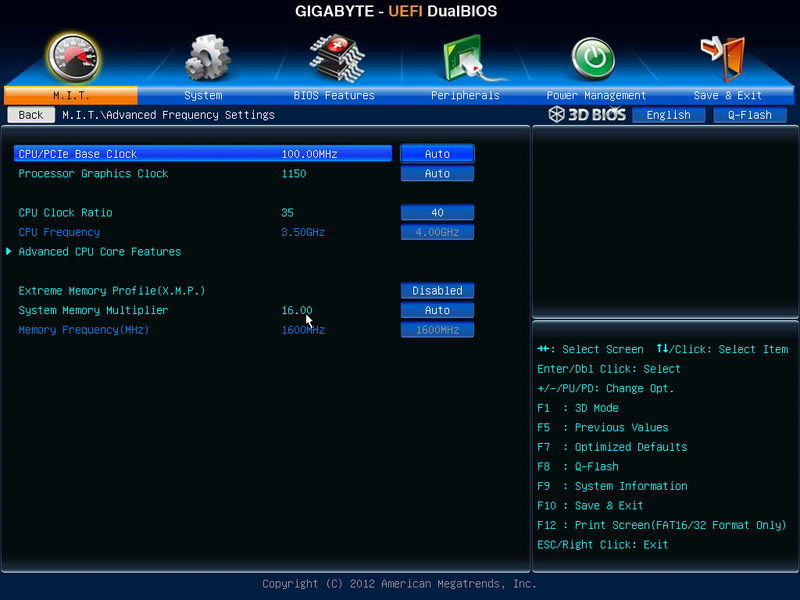 Did the G.Skill RipjawsX DDR3-2133 set speed and timing, volts. correctly in X.M.P mode. The only managed to work in Auto. Im thinking its an incompatibility issue at this time. I will report back when I get 'proper' memory for the board. Nice review as always, my fellow OCFers. Good job, ED. Actually, this board caught my eye when my P67 Extreme4 died. I was between the UD5H and the MVG. I couldn't find any review here of the UD5H, but I saw a thread by the Leader about the MVG, so it was crystal clear for me. 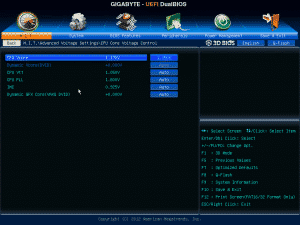 Have you had any freezing/lockups in BIOS while dialing in your overclocks? 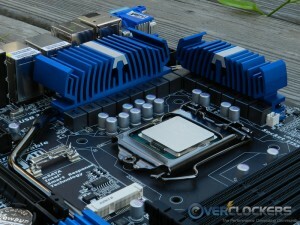 Your board has purple caps and no slot/gap between the ram slots but the early/original release of the ud5 has blue caps and a gap between the second and third dimm slots. It seems like these earlier samples can experience this problem if the your o.c settings are not fully stable... probably due to the chip being under some kind of load in BIOS. If your voltage settings are stable or if you run default/stock settings it doesn't seem to happen. Thats great information to have PolRoger.. thank you. Yeah, outside of the memory issue, which appears to be a simple compatibility problem with the sticks Im running, this board worked out really well out of the box. 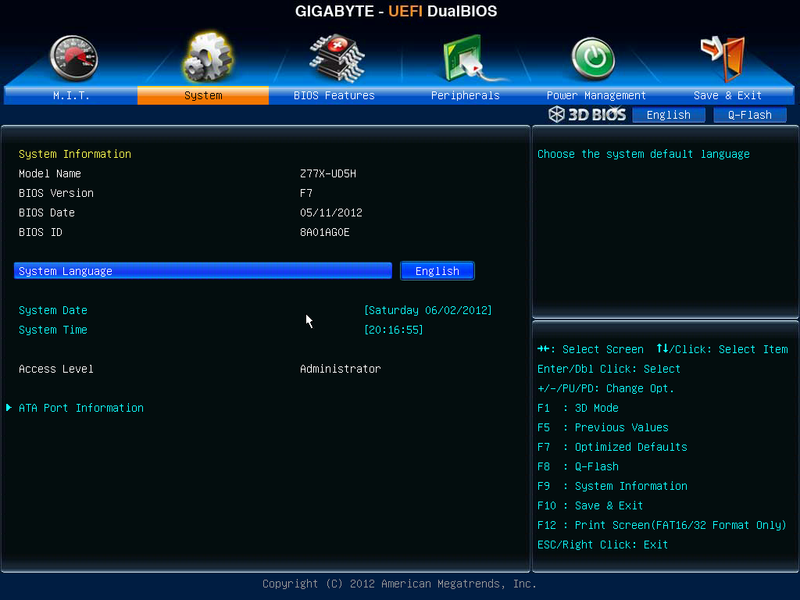 The other board I have, it has frozen in the bios as well... I wonder if your theory applies to this board as well (as there sure is a bit of a load in the bios judging by temperatures). 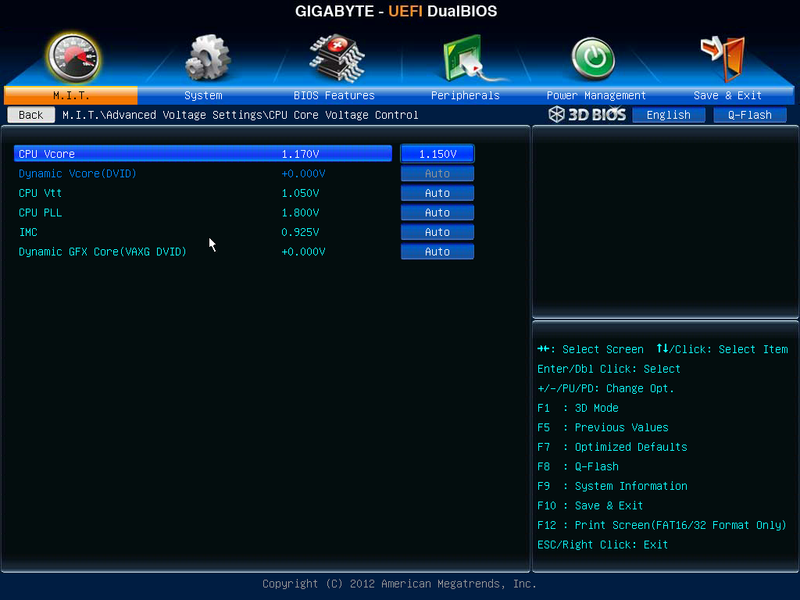 It's been a while since I owned a Gigabyte board. 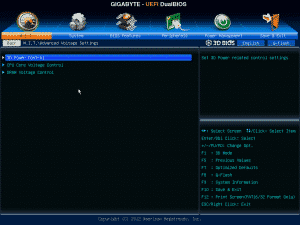 Correct me if times have changed but it seemed to me, way back when, that the Gigabyte download arena was extremely slow. But it also seemed the same for Asus although I've bitten my tongue owned a couple of their boards in the past few years. Nice review. :salute: I'm still trying to discern the best direction to go for the IB upgrade that I want to perform, not writing off any MBs, just being prudent. What is your impression of this board vs. Bobnova's review of the Biostar TZ77XE4? Comparing them seems to be apples and oranges from what I read although both seem to be capable units. Their DL section is a bit slow, but nothing heart breaking. As far as this board vs the other one. The biostar seems capable as does this one. It really boils down to the feature set you want. For example, do you need wireless or Bluetooth? This is for you. If not, the board is still good, but there may be other cheaper boards that have the feature sets you need. As always with a build, I go as cheap as possible with the feature set I really need. So I went with the Microcenter $189 i5 3750K deal with $50 off any Z77 motherboard. 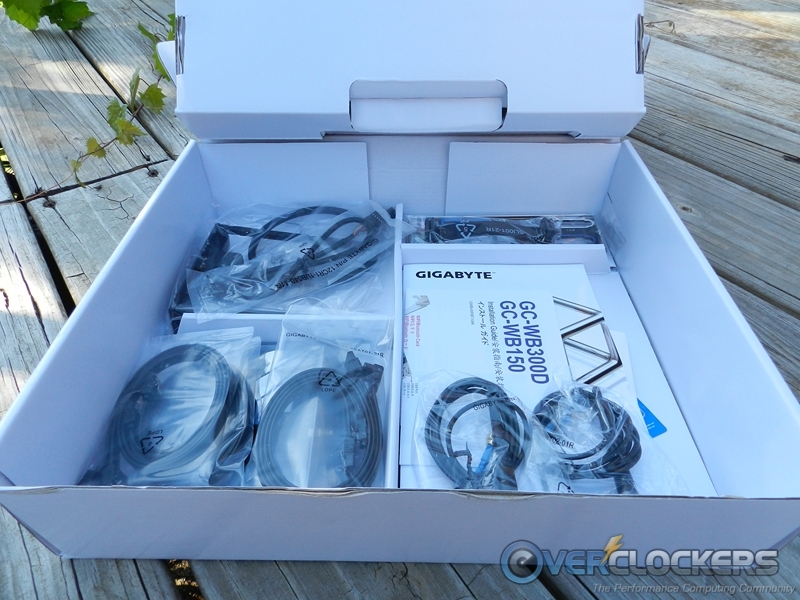 I needed SLI for my pair of GTX 460 1GB cards, and kinda wanted mATX for a future transplant to a smaller case. 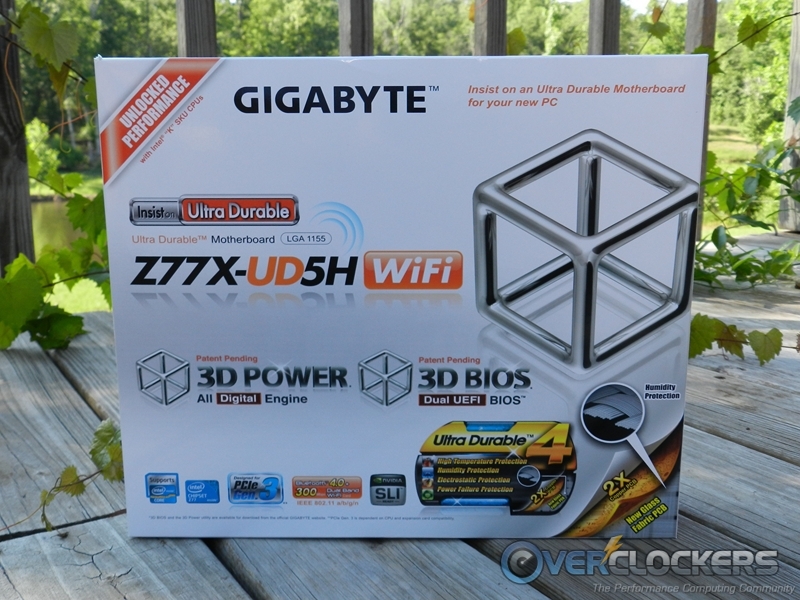 So I picked up the i5 3750K yesterday with a Gigabyte Z77MX-D3H for only $79 after the $50 off (total $268 plus tax for the combo). 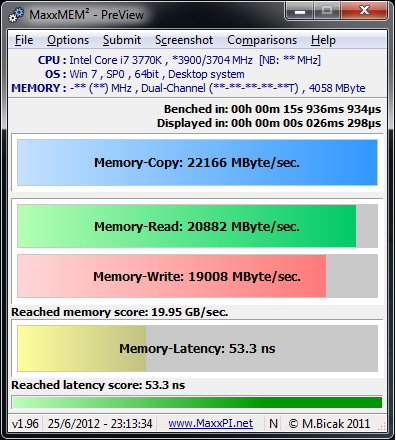 Got it running easy with the only issue being that I updated from the preloaded F5 BIOS to the latest F12 to get the Kingston DDR3-1600 running on spec. With a 15 minutes of messing around it's running at 4.5 GHz with some benches run successfully. 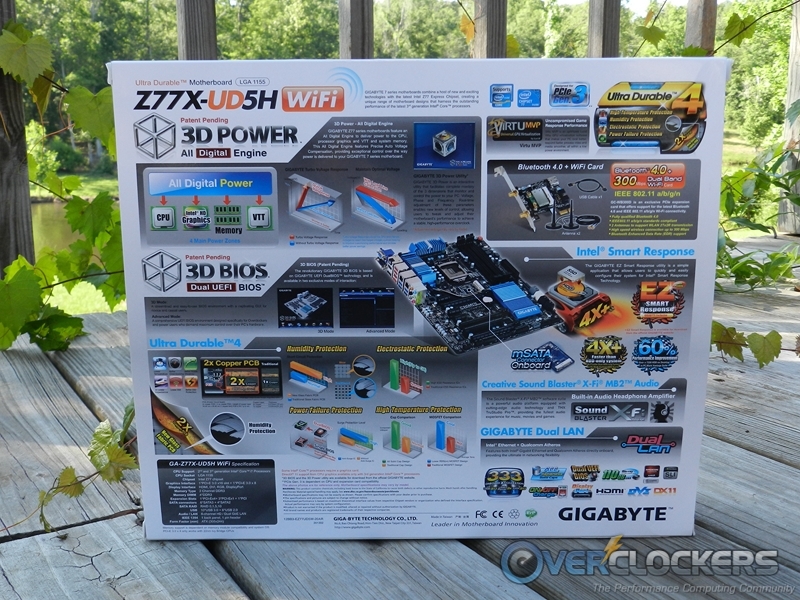 Seems like a nice board for a budget build if you need SLI capability in a small, inexpensive package. 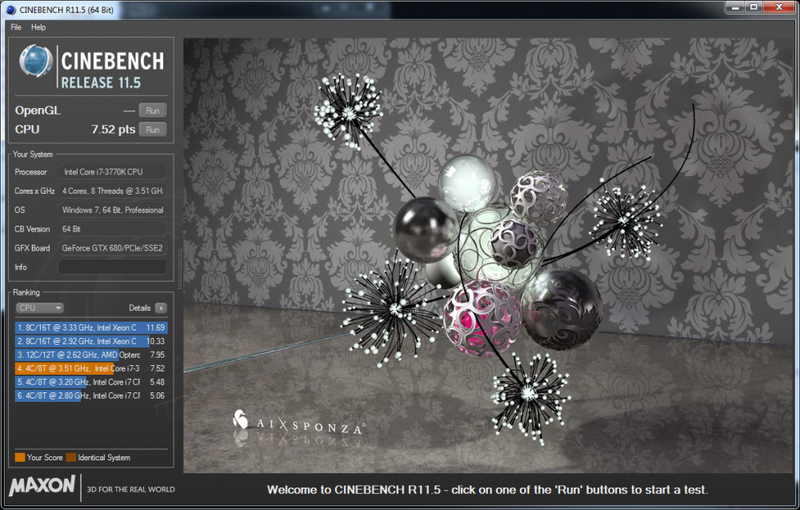 Here's a comparison with Cinebench scores from my i5 2500K@4.7 GHz and the i5 3750K@4.5 GHz. 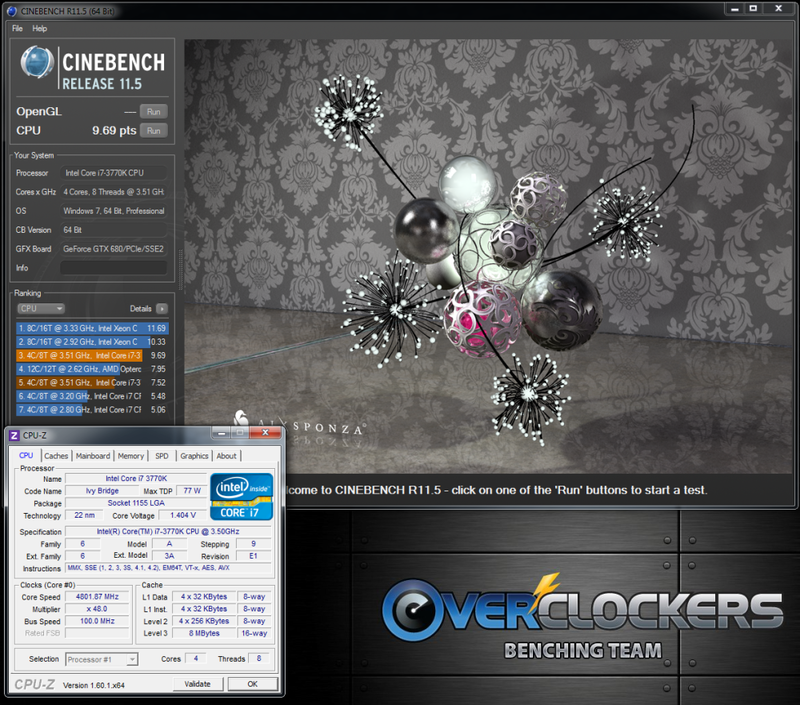 The IB beats SB even at a slightly slower clock, but both are blown away by the i7 3930K SB-E though. 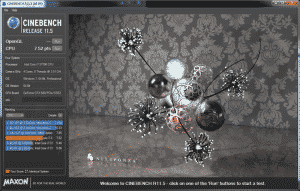 I don't see the Gigabyte Z77MX-D2H on the Gigabyte site? Do you have vcore voltage control on the Z77MX-D2H? 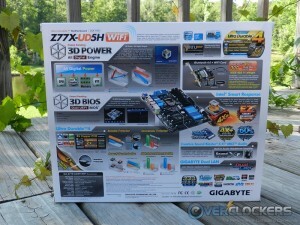 Sorry it was late and I fat-fingered the motherboard designation, it's the Z77MX-D3H. They did a review of it at Anand's a while back. And yes, it has all the standard tweaks in the BIOS.